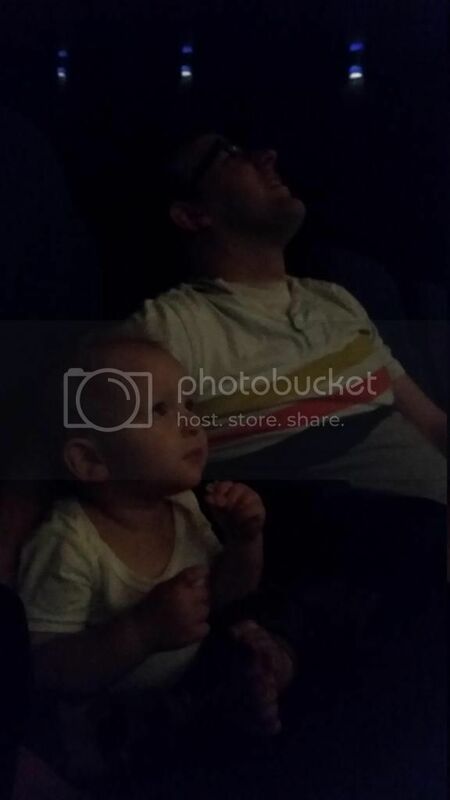 When George was very young, we took him to quite a few movies. So long as they were fairly mellow, he was great! Last November, we took George to see Frozen. Yeah, no. He couldn't even make it past the ice cutters, poor dude! Since then, we haven't tried taking him to a movie again, until yesterday. On Tuesdays at our local theater, they've been doing five dollar days--any movie, any time, five bucks. We, along with my family, decided to hit up that awesome deal to go see The Giver--a fairly mellow movie, right? 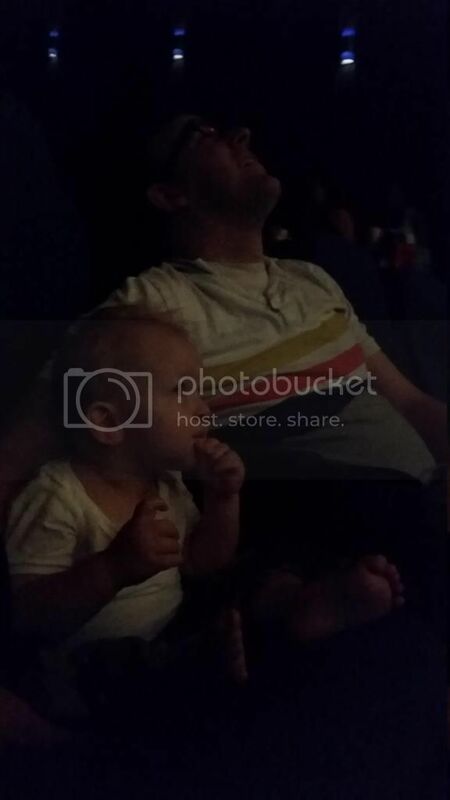 So, we choose front row seats so George could crawl around with his toys when he wasn't watching the movie. He was doing great with pre-show previews. Here we were thinking, "It's going to work!" First preview comes on--some show about a bear--and he went up and sat by Brad on the theater seats. He was eating pizza crust (from the three dollar Pizza Hut pizzas they also offer on Tuesdays), and he was actually laughing. I was like, "DUDE. We did this! It worked! We can take him to movies again!" Then, in that first trailer, a shower sprayer turns on, which just-so-happens to be one of the greatest fears of our kid (no joke, he haaates them), and George freaks out. Brad and I just started laughing. Brad immediately scooped him up and took him outside, saving him from that shower head. George watched a bit more of the movie (probably the first twenty minutes) before it was clear he was not cut out for the movie theater yet. This moment is something I'm grateful for because I am constantly pleased with my husband, my son, and how we work together. In everything that happened, there was never frustration, or anger, or anything negative. There was literally just, "Okay, this is what we've got to do," and we all worked together and we did it. I don't even know if this makes sense to anyone but me. For me that moment was something to be grateful for because, in what could've been some big ol' family freak-out, there was nothing but laughter and just getting the job done. Brad took George home and told me to stay at that movie with my family, all with a smile. I love that moment because it showed to me, "That's exactly what I want our family to be." I'm grateful for that. Every Wednesday my sister comes over and we hang like homies. I love Wednesdays. I love Alix, she's my best friend. I feel nothing but grateful that I am lucky enough to have a great relationship with my older sister. More and more I've seen that people just don't have that sort of relationship with their siblings, and every week I'm reminded how awesome I have it. My sister is amazing. She's hilarious, smart, kind, giving, thoughtful. We can talk about silly topics like the deeper character meanings behind Witches of East End (trust me, it's totally there), while in the same conversation talking about deeper issues on our minds. We aren't the same person, we don't have all the same opinions or thoughts or ideas, but we don't feel the need to tip-toe around each other. We don't argue, we just talk. We can be open and totally honest with each other. She loves me past my faults, and I love her past hers. My sister is, again, my total best bud and because of that I love Wednesdays. As a very simple and last bit of gratitude, I just love George's personality. He's such his dad, but he's so much like me at the same time. He's silly, he's completely his own person, and he's definitely got his own opinion. He thrives on people like Brad, but at the same time doesn't like large groups of people or people who enter his bubble too quickly, like me. He loves to people watch--something both Brad and I love to do. But George is still all his own. He's such an individual, he's no ham and doesn't care what anyone would like him to perform, he'll do it when he wants to. He's so smart and just so thoughtful. He analyzes everything he's given. He wants to look at things from every angle. He's his own person, and I am grateful for that because man, it makes us smile! 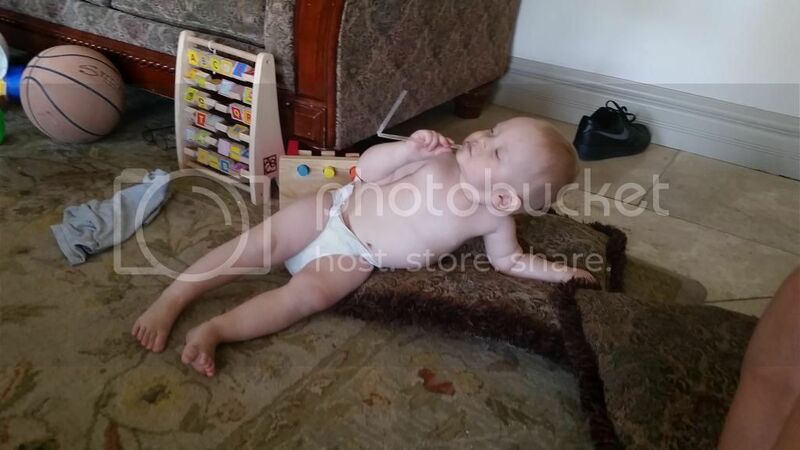 I mean, dude, look at his new thing where his lounges like a rich guy everywhere. It's hilarious. And it's so him.